Chop zucchini, bell pepper and onion. 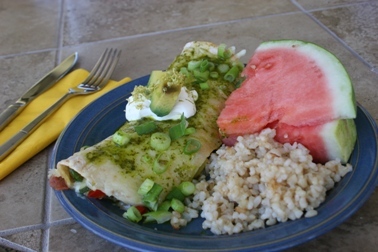 Combine halibut, vegetables and grated cheese in a tortilla. Add small but equal amounts of enchilada sauce and cilantro lime sauce over the halibut. Roll and place creased side down. Grate cheese over the tops of the enchiladas. Remove and add the rest of the cilantro lime sauce over the top of the tortillas. Chop scallions and cilantro and add to the top. Place a dollap of sour cream in the middle and add a slice of avocado. I prefer to order Alaskan halibut from Vital Choice because it tests very low in mercury and you can get a deal on larger orders.